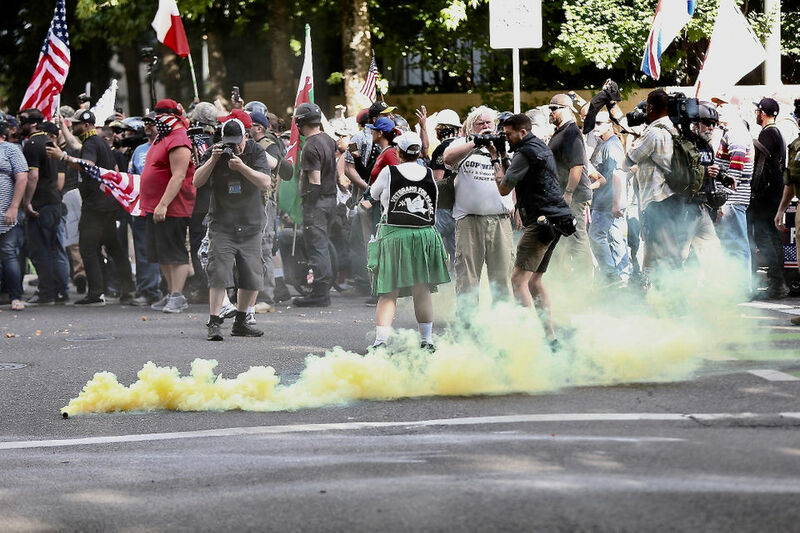 Report and sobering analysis from someone that was on the ground in Portland on June 30th. When we got there it was almost 4 pm with large groups on both sides. It’s very hard to estimate numbers but it seemed as if there were about 150 on the antifascist side and 60 on the fascists side. The rally started at 4 and they were heckling and yelling at us while having their speeches. The entire park was fenced off and cops in riot gear were behind the fences holding guns. There were also multiple groups of pigs in the park where our side was standing. They kept coming into the group from behind and pushing through people to intimidate us. These cops weren’t in riot gear and also had some “medic” cops among st them. There was definitely a heavier police presence than past rallies and events. Not much happened between the groups for about two hours as the speeches went on and every so often we heard sickening chants of “USA!” coming from the group. Once or twice, a school bus appeared carrying more people to the Patriot Prayer side. Around 6 PM, they began marching. When they first stepped off the street, it appeared they were facing away from us and would begin marching that direction. However just before they began moving, they turned towards us and instead marched directly towards us. We intercepted them at the corner right by the plaza and people threw eggs, garbage, and lit fireworks at them. There were loud flash bangs that went off and other fireworks popping on the ground. DHS started firing rubber bullets and BBs at us and many folks got hit. Some protesters took hits to the head with these projectiles and were severely injured. At least one person was taken directly to the hospital after this attack by the police. There was no warning from DHS that they were about to fire, they simply started attacking us. There were pepper balls thrown into the crowd by the pigs and we were pushed back as mace started to fill the air. Patriot Prayer turned around the corner and we had a block separating us. The march went north a few blocks and we turned onto the street they were passing by and got right next to them. There were multiple bangs and more fireworks set off, I wasn’t able to see from which side. There were a few minutes of yelling back and forth and some people on their side charged at us running with the majority of the group following. As violent fights broke out the scene was incredibly chaotic and instantly people were getting serious injuries. Unfortunately some folks on our side had decided to go to the waterfront in the hopes of confrontations at the fountain but this resulted in our numbers being split and actually made us more vulnerable and we had less defense when things got really extreme. The fascists had shields and flag poles and beat and injured many people with their weapons. The fights lasted about ten minutes and broke up as more people got hurt. There was blood all over the sidewalk and people who had their faces smashed in and unable to stand. People were trying to regroup and also continue to follow the fash as more and more cops started to roll up from behind us and come in from the street where the fights had just occurred. Our numbers had shrunk with people leaving for medical care and supporting those injured. We kept going north in the street and had a block in between us and the march as we had before. We were at a very fast pace at this point, we had cops on all sides of us and the fascists on our right. People started making barricades in the side streets that Patriot Prayer would potentially try to march down. There was quick thinking and combined effort as people took garbage cans and construction materials to build fast. The group made barricades and moved on quickly as the march continued north. There were multiple paddy wagons that came down the street behind us and many pigs started to emerge from all sides. We crossed into a side street to confront the march a second time and were met with a wall of cops protecting them in the front. There were rocks and other projectiles thrown aimed at the march and the cops as well. At this point the march was a fair distance away still and there didn’t appear to be a way to get close to them. Many deafening bangs started to fire off presumably by the cops. More chaos ensued as our numbers continued to shrink as people got separated and forced to leave. The cops numbers kept growing as they marched towards us. They officially got on the speaker and declared a riot and that we would be subject to arrest were we to stay there. We decided it was a safe decision to leave and headed back to the plaza to see whether or not the rally was continuing. When we got to the plaza, the fash was safe behind walls of pigs and the police announced that all three parks were getting closed down immediately. There was still a large number of antifascists in the parks and we slowly left as cops rolled in. The fascists believe this was a total win for them. They left us more injured than we left them. They were bigger and had stronger muscles than we did. But let us not count our victories and losses purely quantitatively. When the fascists first charged, many antifacists ran back from them. This was not a cowardly move, though the fascists have made many comments calling it so on social media. We know that they could have killed us, shot us, and stabbed us before. There is no way for us to assess exactly what threat we face, and I would rather be called a coward by the fascists than lose my life. Still, when I saw my friends being beaten on the streets, surrounded by huge men kicking their bodies and stamping on their heads, I ran back into the midst, bat swinging. Alone, I would not have been able to push them back. But others ran back into the crowd with me, and with fierce anger we were able to rescue our injured friends and get them to safety. To the fascists, this was a win because they out muscled us. But neither my goal nor my desire is to ever be a walking, talking ball of masculine violence. The fascists out muscle us because all they know is violence, force and a misogynistic culture that values pure strength over anything else. None of this is to say that we should not use violence against them. Of course we must respond to their violence with violence. I don’t know any antifascist who doesn’t want to defend themselves. So, we can’t out muscle them, but we can outsmart them. We are more agile, we are smarter, we are braver. We love each other with a force that the fascists could never understand. We have so many tools at our disposal. We were ill equipped on Saturday to defend ourselves as much as we would have liked. We never want to see our friends hospitalized, broken, concussed. We did what we could with the tools we had brought with us. Let us learn from this that we need more tools, both physical and mental. We all need to consider what more we could have done and what we would need to accomplish it. All they know is how to punch, but we are creative – and not just in the streets. Remember that in the streets is never the only domain in which we fight fascism. We don’t have to follow the rules. And our creativity, internal strength and defiance will lead to their destruction.